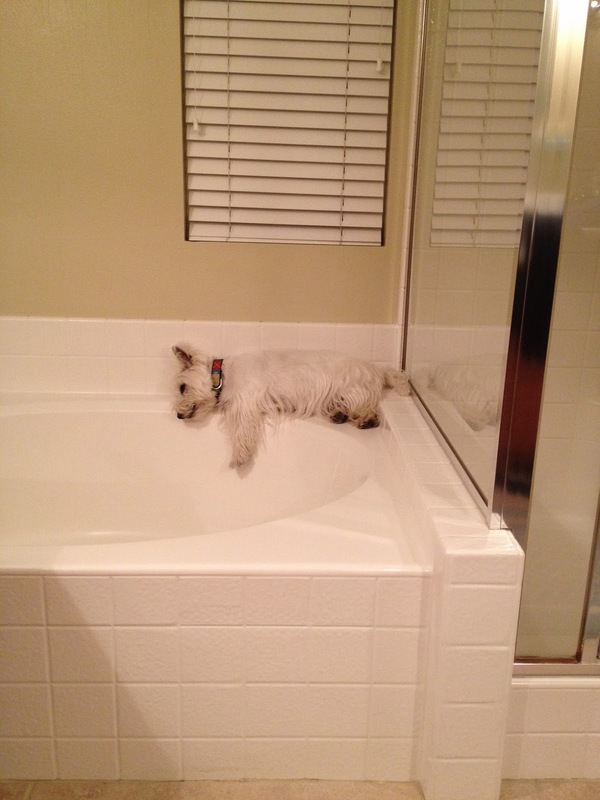 The White Dog Blog: What's a guy gotta do to get some rest around here? Mom having a BAFF, whatevers for ? I would put my paw down about this Duncan ! Oh we loved seeing you a sleeping in that big white bed, I wonder why your momma did that to your bed...what a cute picture. Duncan, this is the funniest post we've seen in a long time!! Who SLEEPS ON THE TUB?!? It was very kind of you to allow your mom to relax in your bed, though!! Good job you didn't fall in to the filled tub Duncan. So very sad when the peeps invade our space!! Frisbee says: Poor yu Duncan! Dids yu gets tu gets in da tub wiffs da bubbles? Dat would habe been fun..poppin da bubbles..But I likes my baffs..yu better habe a serious talk wiffs yur Mom abouts yur space fur sure! Yur fwriend Frisbee..
OMD! Talk about living on the EDGE!!!! Be careful you don't slip! Your mom steamed up your nice cool spot, Duncan! Really Duncan! you sleep on the edge of the tub! Careful you don't fall in the water - yikes! BOL! That is so funny that you like to sleep there. What if you roll over? Crikey Duncan ..... what was your Mom thinkin'? Couldn't she do that some other time? You need your rest, mate!! If ya don't like baffs, sleepin in da tub could be dangerous. OH GOOD GRIEF.... What Fresh Heck is THIS??? Please tell us she didn't leave little HAIRS and stuffs in there, too? We think that if she tries this again... you should PEE in the Tub... THat would keep her outta they... by PROVING it is YOUR TERRITORY and not HERS. Oh Duncan! WTF???!!! I hopes you sat there and stared at her til she got out and gave you YOUR tub back...no? Oh man! I say, sit on her pillow and wiggle around on it...that'll teach her some boundaries!! Tonight...stake our YOUR tub early!! Ya snooze...well...you snooze! Could you please send an email to me using lfurman1987ATyahooDOTCOM so I can get an idea of what you'd like to receive for the holiday gift exchange?